"Since the death of Anthony Buckeridge on Monday, it's been an uphill struggle convincing non-Jennings fans about the charms of the great schoolboy anti-hero of my 1970s childhood.... ..."
"The Guri and Gura series, six children's books about two loveable mice with hearts of gold, has entertained generations of Japanese children since its debut in 1963. Today, the success of the series, with its subtle promotion of traditional values, shows no sign of abating..."
News: Harry Potter book 6 title revealed? "The prose is lumpen, the attempts at mystery stifle the narrative and the characters are marionettes working at the whim of higher powers... ..."
"Summer is so exciting because finally, it's a time when teens come into the library and ask for books they want to read," according to Betsy Levine, the San Francisco Public Library's teen librarian. Awaiting them is the burgeoning world of YA, or young adult literature, where recent innovations, from novels in the form of instant text messages and verse to crossover titles that are attracting as many adults as adolescents, are redefining a genre that once had little appeal for teens. Amanda Craig reviews Troll Fell by Katherine Langrish ("Told in vigorous, vivid prose, Troll Fell is not just a marvellous, magical adventure but one which recreates the Viking way of life with the kind of imaginative touches that will please teachers...") and Measle And The Wraithmonk by Ian Ogilvy ("a terrific tale in every sense, a fable about overcoming depression and feelings of inadequacy that will thrill children of over 8 long before its spectacularly happy ending"). "Now (NB, June 11 2004) J.C. complains because Haddon has won the ?4,000 McKitterick Prize, despite having earned (it is implied) quite enough from his book already. It?s a strange criticism: I don?t remember any complaint from J.C. when, for example, the well-heeled Ian McEwan won the W.H. Smith award (worth rather more than the McKitterick) with his bestseller Atonement. Or is this a rule that applies only to those J.C. thinks of as children?s writers?" Incidentally, the same N.B. 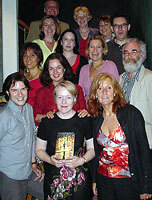 column (June 11th) reported the outcome of the Sagittarius Prize, awarded to a novel 'by a debutant over sixty'. Also worth ?4000, and awarded this year to The Two Pound Tram by William Newton, it is sponsored by Terry Pratchett, who is also very generously sponsoring this year's Branford Boase Award, to be announced this coming week. Hats off to the normally behatted Mr Pratchett! Megan Larkin, who previously worked for Orchard Books and has been a consistent fan of the colour pink (remember the UK jacket for Spinelli's Stargirl?) wore pink shoes to launch the new Usborne Fiction List at an event packed full with authors, agents, booksellers and reviewers, despite the clash with the TV broadcast of England's quarter-final. Champagne flowed freely in the courtyard at Dartmouth House, home to the English Speaking Union, where a bouyant Peter Usborne gave an upbeat assessment of his company's current turnover. "We're on a roll," he said. Which is good news for the authors signed up for this autumn and next year. 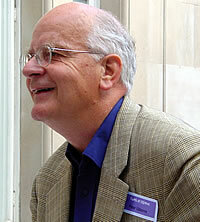 Larkin has come up with an interesting mix of UK and US books. Notably missing at this stage, however, is new young talent. Linda Newbery, initiator of the group protest to my stand on peer reviewing in The Guardian, tells me that all three Historical House titles are now being published at the same time, in November. Also exceptionally bouyant on the evening, and deservedly so, was Justin Somper, obviously well-pleased with another successful launch. Somper is handling publicity and key promotion for the list, and will be setting in motion an ACHUKA interview with Rodman Philbrick, whose Freak The Mighty gets its first UK release on the Usborne list. I'm heading off to Dartmouth House, Mayfair, for the launch party of Usborne's new fiction list this evening, and had expected to find the first six titles, which begin publishing next month, featured on the Usborne website, but I can locate no information about them at all, which is strange. Just as well I have the handsome 'Fabulous New Fiction' box of distinctive pink proofs, which include Polly's March by Linda Newbery (the opening book in The Historical House sequence, with titles by Ann Turnbull and Adele Geras to follow) and a first UK edition of Rodman Philbrick's Freak The Mighty. First to publish, though, are Princess Ellie to the Rescue by Diana Kimpton and A Turn In The Grave by Bowvayne [jacket images as yet unavailable on Amazon]. "Tim Robbins will star in Columbia Pictures' Zathura, directed by Jon Favreau (Elf), says Variety. The adaptation of Chris Van Allsburg's children's book starts shooting in August..."
"With the release of his new novel, Girl Underground, the best-selling children's author of titles like Toad Rage, Bumface and Two Weeks with the Queen is out to tackle the 'nameless, faceless' fog of fear and ignorance surrounding the issue of children in detention.... ..."
Judith Ridge has written the Teachers' Notes for this novel, which can be found on Puffin's Australian website. Suspense occurs when the reader is about to learn something, not simply about the relationship of fictional characters, but about the writer's relationship to a set of ideas, or to the universe. Suspense is the product of teaching, and teaching is the product of mastery, and mastery is the product of seriousness, and seriousness springs not from ego or ambition or the workings of the subjective self, but from the amazing permutations of the objective world. This mini-meditation on the properties of suspense had been prompted by a bout of flu and a sickbed reading of Thomas Hardy, which helped Ozick the novelist and critic see more clearly the limitations of the modern novel. The observations may seem, at first, to have little to do with childhood reading and with children's books (albeit that she makes several references to children's literature in her essay). Certainly, it doesn't apply to the bulk of children's publishing's current output and that is because the bulk of children's fiction, at any one time, is always going to be lacking in mastery, and positively allergic to seriousness. But apply Ozick's comments to the best that children's literature has to offer - Philip Pullman, Paul Jennings (and I cite this disparate pairing intentionally) - and it will be found that her definition fits both the work and the author. "Madonna's Yakov and the Seven Thieves is the most visually magnificent of her three children's books, but the dreary and inappropriate story is lackluster and verbose... ..."
"The movie is based on Rosalind Wiseman's bestselling book, Queen Bees And Wannabes: Helping Your Daughter Survive Cliques, Gossip, Boyfriends, And Other Realities Of Adolescence." "Lohan's home-schooled Cady Heron character has to learn to navigate the treacherous waters of teen-girl politics when she attends high school for the first time..."
With her freckled arms and small teeth, Lindsay Lohan is not your typical American Queen Bee. I went to see Mean Girls yesterday, having previously seen Lohan in Freaky Friday. She was good in that, and she's just as good in this new film. In the newly released illustrated children's book, Bread Song, 8-year-old Chamnan, a recent Thai immigrant, takes his grandfather's hand and together they count the 25 cobblestone steps they take to cross from their home above their Thai restaurant to Alison's Bakery. Eva Ibbotson creates a marvellous world of rich and poor, kind and unkind, young and old against a background of Viennese convention. The Star of Kazan is a heartwarming, old-fashioned adventure, every bit as absorbing as Ibbotson's prize-winning Journey to the River Sea. Author and radio commentator Daniel Pinkwater didn't grow up in Hoboken, but has spent many afternoons in his own idiosyncratic imagination pretending that he did. His latest children's book, Looking for Bobowicz (HarperCollins, ages 8-12), follows the adventures of young Nick Itch, who moves to Hoboken from suburbs during the hottest heat wave in 120 years. 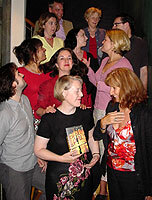 Debi Gliori's latest novel about the Strega-Borgia family, Deep Trouble, was given a distinctive launch at the Italian Cultural Institute last night, with three actors playing roles based on the novels. "HONORARY fellowships will be presented to Merseyside's finest, Liverpool John Moores university has announced. Among the fellows are ... ... Screenwriter Frank Cottrell Boyce will have his contribution to film recognised ... ... Wirral-born children's author Shirley Hughes, daughter of stores magnate T J Hughes...."
The presentation was made yeaterday at the Royal Festival Hall by Estelle Morris, MP, Minister for the Arts. 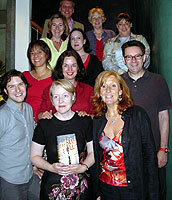 The CLPE Poetry Award was set up in 2002 and was awarded for the first time in 2003. The award aims to honour excellence in poetry written for children. It is presented annually in June for a book of poetry published in the previous year. This year's judges were Morag Styles and Michael Rosen, with Margaret Meek Spencer as chair. 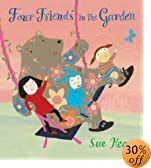 "Children's author Morris Gleitzman was a guest in the Chat Room with Jo McManus and Peter Holland. On the table for discussion his views on why boys won't read and political statements in children's literature... ..."
There is a link to a 21 minute audiofile of the chat which I haven't had a chance to listen to yet, but certainly will do. Quite a substantial interview, with further online references. Useful G. P. Taylor resource. "A French actress has won the part of Fleur Delacour, dispelling rumors that Kate Winslet will play the role in the fourth installment of the "Harry Potter" films... ..."
Scholastic US, the world's largest publisher and distributor of children's books, have announced that Warner Bros. has acquired the movie rights of best-selling mystery novel Chasing Vermeer written by debut novelist Blue Balliett and illustrated by Brett Helquist. "Up to 1000 people are expected to converge on Flock Hill Station near Arthurs Pass this spring to film the climactic battle scene from C S Lewis' The Lion, the Witch and the Wardrobe...."
?Time and time again, there are instances of a writer going into a school and the teacher even doesn?t come, leaving it instead to a teaching assistant. This shouldn?t happen even once. There are far too many teachers teaching our young children who don?t love books.? The star-studded cast of Puffin guests enjoyed a glorious summer evening, as can be seen in the full Picture Gallery. Any suggestions for captions to these three? 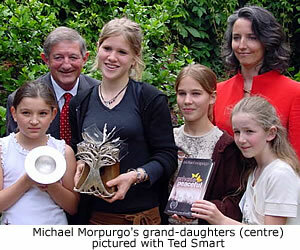 Good coverage in The Independent for Michael Morpurgo's success at the Red House Children's Book Awards. "In a rare victory for French books, which sometimes have a hard time making it on the international market, the British publishers of the Harry Potter books have bought up the rights for a French-language children's tale for over 100,000 euros... ..."
"Carle is the gentlest of teachers, but his books always add to a young reader's knowledge...."
with 'Children's Laureate' Michael Morpurgo voted the outright winner. 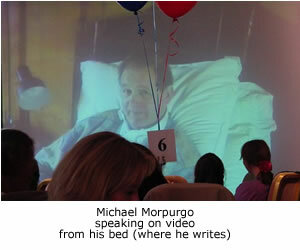 Michael Morpurgo was unable to attend the presentation. Two of his grand-daughters accepted the award, the older one speaking briefly on 'Michael's behalf with remarkably relaxed self-assurance. The children's laureate was one of several absent nominees who spoke via pre-recorded video clip. On occasion, the narrative shifts into the present tense, without seeming to add value - there is already an immediacy to the storytelling, and these particular moments do not seem to be those of heightened drama. But this detail is overshadowed by the sizzling pace, richly drawn char acters and a resoundingly moral and important story. Abandoning an attemot to drop in on the TES Summer party at the Serpentine Gallery when I got to the end of the South Kensington museum subway, looked at my watch and calculated the time needed for the remaining walk + time needed for return into West End, I turned heel and headed back to the Embankment and arrived at the Wellington St cafe soon after seven, to be immediately introduced to Katherine Langrish, author of Troll Fell. Collins MD, Sally Gritten, delayed in traffic, eventually made an entrance worthy of Edina Monsoon, standing on the stairs leading down to the moodily-lit basement wearing her shades and shouting out her apologies. 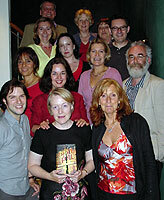 Katherine Langrish thanked those who had helped the book on its way to publication, revealing that it had been rejected by several publishers and agents, before being taken on by Catherine Clarke (at Felicity Bryan), then sold for a high sum in a hotly contested auction. She has just delivered the next book, ahead of deadline, provisionally titled Troll Mill. Spike Lee and his wife, Tonya Lewis Lee, are set to bring the young-adult novel Miracle's Boys to television. The book will become a six-episode miniseries on The N, the nighttime, teen-oriented incarnation of cable network Noggin. "It is not often that I feel like celebrating something by doing cartwheels along the central reservation of a motorway, while singing the rudest song I can think of, but the publication of the Ofsted report giving a monumental pasting to the 117-item foundation stage profile was one such moment.... ..."
Only a tenuous link with children's books, perhaps, but I couldn't resist listing this splendidly splenetic piece from Ted Wragg. P.S. I realise now this article was a week old. The Guardian website hadn't updated its Tuesday section when I logged in quite early in the morning, and this was a piece I'd missed in the paper edition. Still worth looking at though. "It's really an unfriendly place for teens right now," he said, surveying the long white table between two book racks, topped with an unembellished, notebook-sized sign reading "Teen Section." He wants to get rid of the outdated books - including the rows of Christopher Pike horror novels and Sweet Valley High paperbacks from the 1980s and '90s. "There's a constant turn-over in YA (young adult) literature," he said. "You've got to be vigilant, make sure you're cool." "I had an idea early on that it might be a good children's book, because there's lots of big colorful equipment," Whouley says of her decision to document each step... Cottage for sale* ... must be moved: a woman moves a house to make a home (Commonwealth Editions, $22.95) was published May 12, the same day the paperback rights were bought by Ballantine Books for a six-figure advance. Whouley says two agents have expressed interest in pitching the book to Hollywood for a film. ...it was the challenging nature of the book that caught Susan Richer's attention when she heard Perth-based Tan - who was only 26 when he wrote it four years ago - being interviewed on radio. She bought the book. After seeing Tan's sumptuous illustrations - which have been compared with Chagall, Dali and Whiteley - Richer was confident she had the makings of a stage play. The Scottish publisher, Floris, will announce tomorrow (Monday) a new prize for writing for children, to be launched at this year's Edinburgh Book Festrival. The first Kelpies Prize will be awarded in August 2005. The winner will receive ?2000 and their book will be published in Floris Books' Contemporary Kelpies series of Scottish fiction for children aged 9 - 12. Christian Macleam, Floris MD, says: "In recent years, we've seen Scottish fiction for adults become increasingly recognised and commercially successful. Scottish children deserve to be able to read the childhood equivalents of Christopher Mrookmyre, Ian Rankin, Louise Welsh and Irvine Welsh - that is, high-qulaity, contmeporary Scottish fiction across many genres. The Kelpies Prize will facilitate that." The prize is open to authors who do not live in Scotland, but their work should be set wholly or mainly in contemporary Scotland, and be suitable for both boys and girls. The work should not have been previously published, although the author may have been. Manuscripts (40,000 - 60,000 words) must be submitted by Febraury 28th 2005. A shortlist will be announced the following July. A judging panel will be appointed annually. "this lavish and unusually well-written edition"
A page of Canadian children's book reviews includes a review of On Juno Beach: Canada's D-Day Heroes, by Hugh Brewster (Scholastic Canada). The Guardian prints an edited extract from a lecture Michael Morpurgo gave at the Royal Society of Arts. The Church of England Newspaper files a report on G. P. Taylor's transatlantic success. A Yorkshire vicar who was challenged by a parishioner to write an alternative to Harry Potter now has seen his book reach the top of the best seller list in America. N.B. ACHUKA's Auction of a true 1st UK proof (Faber) of Shadowmancer ends TODAY, 7.30pm UK time. The country singer Rimes and her husband, Dean Sheremet, recently finished their second children's book, called "Jack's New Friend," (search) and the 21-year-old says she's working on a third. Her first, "Jag" was published in 2003 by Dutton Books, but Rimes says singing is still her first job. 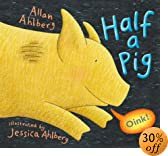 An acidic look at the spate of children's books by celebrity authors and the motives (monetary and psychological) at play. Bubba, "born big and mean, full of teeth and ready to bite," is the creation of children's author Wendelin Van Draanen. But that doesn't mean she made him up. 'I've written the first draft of what I think is a young adult novel about punk, bigotry and high-school football in 1970s Glasgow. It's not surrealistic at all. Well, not too much. It'll get weirder, I'm sure," says the Scottish-born, US dwelling winner of The Scotsman and Orange Short Story Award, with ?7500 prize. "The Legend of Nezha, a very popular cartoon book based on an ancient Chinese folktale, has replaced Harry Potter and became the best-selling children's reader in the Beijing Bookstore Building, the largest bookstore in Beijing..."